Halloween is right around the corner, and these days Halloween isn't just for kids. More and more Halloween parties are held just for adults, costumes included! If adult Halloween costumes aren't your thing, the next best thing are spooky or cute Halloween tees! I received the Zombie Tux Halloween shirt for my husband. The first thing I noticed were the bright, bold colors! The next thing I noticed was the quality of the t-shirt itself. It was thick, durable and super soft, all of which make it high quality and comfortable to wear. 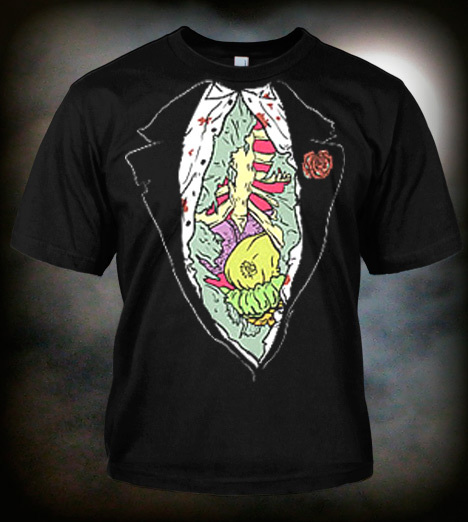 This is a spooky Halloween shirt that is going to get people's attention! No matter what your style, Halloween shirts are fun, functional and a frugal Halloween costume choice! I received one of the spooky adult Halloween shirts mentioned above for free using Tomoson.com. Regardless, I only recommend products or services I use personally and believe will be good for my readers. What are you going to dress up as this Halloween?